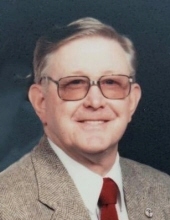 Celebrating the life of Guy "Grant" Ball, Sr.
Obituary for Guy "Grant" Ball, Sr.
.Guy Grant Ball, Sr. passed away March 21, 2019, at the age of 92. Grant is preceded in death by his mother, Wilma Powers and his father, Arthur Ball. Grant is survived by his wife of 72 years, Margaret Greer Ball, and his sister, Millie Faus. Grant and Margaret have three children: Phyllis Kilby (William Kilby), Guy Ball, Jr. (Kimberly Bannister Ball), and Philip Ball (Natasha Sharp Ball). They have 10 grandchildren: Nikki (Tony), Becky (Juan), Bradley (Imelda), Megan (Doug), Channa (Shane), Andrew (Tiffany), Valene (Philippe), Lainey (Greg), Jeremy, and PJ. Grant and Margaret are proud to have 16 great grandchildren: Anthony, Cole, Victoria, Hannah, Jacob, Alex, Will, Evan, Hannah, Grant, Finley, Emme, Christian, Jeremiah, Isaiah, and Mateo. Grant was born in Helton, North Carolina in 1926. At the age of 18, he was drafted into the United States Army and served nearly two years in the 318th Infantry in Germany and Czechoslovakia, from 1944-1946. Just six weeks after returning to the U.S., Grant married his sweetheart, Margaret. After a brief adventure in California, Grant and Margaret settled into the Amish Country area of Pennsylvania, near her family home. Grant worked at the Luken’s Steel Mill in Coatsville, Pennsylvania, for 35 years. Grant was known for always having his camera ready for a quick picture, whether it was of the family eating together or of an Amish clothesline flapping in the breeze. Grant and Margaret were founding members of the Calvary Missionary Baptist Church in Rising Sun, Maryland. Grant was the Adult Sunday School teacher there for thirty years and started the tape ministry at the church. His fondest memories, however, are of driving the Sunday School Bus and picking up nearly a hundred kids each week for church, forever changing the hearts and lives of the children in his community. Later in life, Grant and Margaret became members of Nottingham Missionary Baptist Church, where they continued to serve until moving to Georgia in November to live with their son, Philip. Grant was a hardworking, honest, caring man who will be greatly missed by his many friends and family. Funeral services will be conducted Monday, March 25, 2019 at 11:00 AM from Martin & Hightower Heritage Chapel with Pastor Mike Adams officiating. Pallbearers will be: Andrew Ball, Grant Ball, Cole Bigley, Tony Bigley, Evan C., and Shane Longmire. Graveside services, with military honors under the direction of the US Army Honor Guard, will follow at 1:00 PM at the Georgia National Cemetery in Canton, Georgia. The family will receive friends at Martin & Hightower Heritage Chapel on Monday morning from 10:00 AM until the time of service. Messages of condolence may be sent to the family at www.martin-hightower.com. Martin & Hightower Heritage Chapel has charge of the arrangements. To send flowers or a remembrance gift to the family of Guy "Grant" Ball, Sr., please visit our Tribute Store. "Email Address" would like to share the life celebration of Guy "Grant" Ball, Sr.. Click on the "link" to go to share a favorite memory or leave a condolence message for the family.